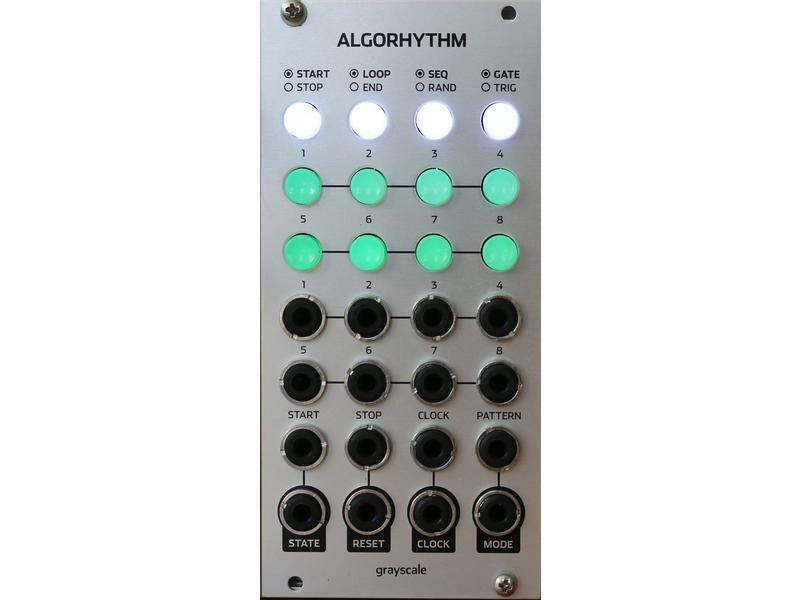 Algorhythm is an 8-step pulse sequencer. Modules can be linked to create longer patterns. Illuminated switches provide control over looped and one-shot playback, sequential and random modes, and gate/trig output for the pattern. Loop length, pattern length, and gate/trig status can be modified during playback. All settings are automatically saved in memory and restored at startup. The most obvious application of a pulse sequencer (also called a trigger sequencer or event generator) is to program a percussive rhythm, like the x0x drum machines of the 1980s. Algorhythm can be used for this purpose, but it's useful to think about dividing an arbitrary time period into discrete segments and generating time-based events within a modular system instead. 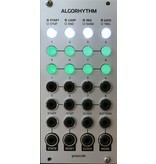 Algorhythm modules can be linked together, creating a pattern with more than eight steps. This can either provide a longer pattern or a pattern with increased resolution. Consider two linked Algorhythm modules. This provides a maximum of 16 pulses generated in series. Whether these pulses correlate to 32nd notes or 8th-note triplets is relative only to the incoming clock speed (and other time-based aspects of a patch).